For twelve years the sculpture Guns into Plowshares could be seen in Judiciary Square, close to the Capitol in Washington D.C. When I told the artist, Esther Augsburger, that I wanted to write about this piece, she sent me a quick condensed narrative of the origins of the work and some rather perplexing news concerning its current fate. I remember hearing Esther first talking about this project during workshops and lectures at different art conferences in Eastern Europe and South East Asia in the late 1990s/early 2000s. I remember looking at the projected images and being impressed by the balance of graceful form and weighty theme in the work. The stories of the inspiration and the circumstances behind the work also impressed me. Along with the elegant design and the supporting narrative came the added bonus of a widespread response from people in different parts of the world as they learned about the piece and its inspiration. Not only was the artist’s imagination set on fire by the biblical theme of ‘swords into plowshares’ and the opportunity afforded by a citywide gun amnesty, but others caught the vision and responded, allowing the theme to resonate in their own life situations. Some would think about creativity. Some would pray. Some would imagine an end to violence in the cities and countries where they lived. It is wonderful when art builds bridges into life in this way. It does not lose its status as ‘art’ by embracing a wider frame of reference, nor does it ‘transcend’ its material limitations or historical occasion. Instead it validates and dignifies those things while also being present to us, here and now. Of course the work also addresses us in potentially uncomfortable ways. It would have been too easy to melt the guns into malleable anonymity. However, their clearly gun-like forms are present on the sculpture’s surface. We are not allowed to forget the former careers of these pieces of metal, even as they are redeemed and transformed in an artwork intended as a signpost pointing to grace and peace. Nor should we lose sight of the overall artwork itself, even though it was quietly moved recently from its former location without the artist’s knowledge or consent. This was done, apparently, to make room for an ornamental fountain. There are many rich lessons of dialogue and cooperation that we can learn from the stories surrounding how this piece came to be. I do not doubt that those who have seen it or learned of it in some way continue to be touched in their hearts and minds by both its artistry and its message. However, I believe that the artwork itself, properly displayed somewhere in a public place, still has much to tell us in our volatile but fragile world of the 21st century. 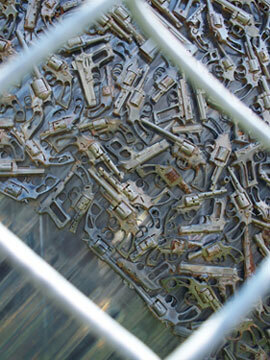 Esther Augsburger: Guns into Plowshares, 1997, steel and 3000 handguns, 19 feet long, 16 feet high. Steve Scott directs CANA (Christian Artists Networking Association.) CANA seeks to engage, connect and empower artists in different parts of the world by running international conferences (SE Asia/Eastern Europe) and maintaining online communication (see http://cana-arts.blogspot.com). The upcoming event (in partnership with Commission4mission and Veritasse) is ‘Run With the Fire’ in the UK in 2012. To read more about ‘Run with the Fire’, click here. To read an article by Steve Scott about the growth of the idea for ‘Run with the Fire’, click here.